Historic 714 Main building in Fort Worth. 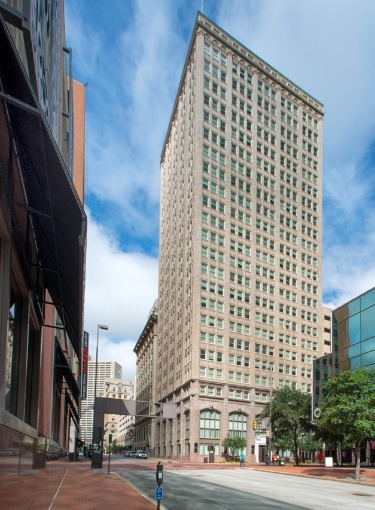 FORT WORTH – (Realty News Report) – Tennessee-based Development Services Group acquired the historic 714 Main building in downtown Fort Worth. XTO Energy, a shale company owned by Exxon Mobil, recently left the 24-story building as part of it relocation of 1,000 XTO employees to the firm’s corporate campus in Springwoods Village, north of Houston. JLL’s Ryan Matthews represented Exxon Mobil in the sale. The 185,000-SF building was built in 1921. JLL negotiated six XTO office building sales in Fort Worth. Built in 1921 and renovated in 2010, 714 Main currently encompasses over 185,000 square feet of office space. Its central location offers close proximity to abundant dining, shopping and entertainment options with the Fort Worth Convention Center and Sundance Square each two blocks away. To date, JLL has successfully negotiated the sale of six of XTO’s office assets in Fort Worth, including the historic WT Waggoner Building at 810 Houston Street to Dallas Stars’ owner Tom Gaglardi’s Northland Properties group in August. With the sale of 714 Main, XTO has completed the sale of its downtown buildings related to the company’s headquarters move to Houston. XTO’s Central Division employees now occupy the Simpson building.